Have you been in a situation where you want to withdraw from your bank account or you wish to send money to someone to make a cardless withdrawal at an ATM. But you discovered that your ATM card or cheque book is not anywhere with you at that moment? At times, it may be you forget to take it with you to where you are going. You need not to border about that again because Fidelity Bank Dial4Cash service has got you covered. Just read on to know how it works in other to benefit from the service. How To Check Your Account Balance On FCMB Using Your Phone. How to Check your Bank Verification Number - BVN Using Your Phone. HOW TO MAKE THIS CARDLESS WITHDRAWAL BEING A FIDELITY BANK CUSTOMER. Next, the steps to go about it will pop out on your device's screen, all you need do is to follow it in other to create a One-Time PIN that will be used at the ATM. Now, you should enter your Instant Banking PIN to confirm the transaction. 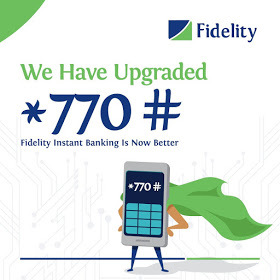 After that, a paycode is being generated from your Fidelity bank account and should be received by you from Fidelity bank as an sms your phone. The One-Time PIN and the Paycode can as well be sent to a third party to make a cardless withdrawal. NOTE: For the very first time of you using this ussd code *770# instant Banking service, you will be required to register by dialing *770# first. - First, enter the one-Time 4 digit PIN you created earlier. - Enter the Paycode that was sent to your mobile phone. - Enter the amount and take your Cash. That's all to do in other to withdraw without your ATM card, so simple isn't it?